Canada is world famous for its outdoor winter activities, mountain peaks, and impressive amounts of snow. These elements added together make it one of the premier locations for your next dream ski vacation. With major mountain ranges on each side of the country, your options for destinations are numerous. Your choice is actually more influenced by skill level, budget, travel distance, accommodations and surrounding activities than any other factors. You’ll find areas like Revelstoke, where fresh powder dominates the runs, or the expertly groomed trails of Whistler may be for you. This is also a good time for the currency exchange rates. Currently the exchange rate is roughly 1.25%, this will stretch your American dollars 25% further in Canada than at home. In addition if you're traveling from outside Canada make sure to have all your paperwork ready because as of March 2016, the process to cross the border is going to be more intensive. Grab your passport and your sense of adventure because the travel guides at ResortsandLodges.com are ready to take you on a tour of the five best ski locations in Canada. 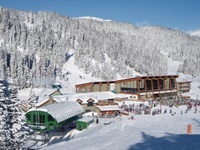 At the top of our list is the world famous Whistler in British Columbia. This is a paradise for skiers of all skill levels and ages with one of the most diverse and numerous sets of ski runs on the planet. The area has an impressive 8,000+ acres of snow covered slopes and a stunning 5,000 foot vertical drop for you to enjoy. Whistler receives a staggering average of 469 inches of snow per year making its slopes some of the best to enjoy on the planet. They feature over 200 different marked and expertly maintained trails to test your skills on. There are multiple places for equipment rentals and expert instruction. Don't forget that the area is also home to three glaciers if you're looking for a high skilled and unique skiing experience. The community is also built for fun and enjoyment. You’ll find activities such as shopping, dining, live entertainment, snowmobile tours, snowshoeing, photography, and so much more. For more information about Whistler and its vibrant community visit the official Whistler Blackcomb website. The next destination on our list comes from the seemingly endless peaks in the heart of the Canadian Rockies: Banff, Alberta. The area is home to three major ski runs at Mt. 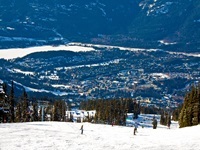 Norquay, Sunshine Village and the Lake Louise Ski Area. The areas combine to make up over 8,000 acres of skiable and picture perfect terrain. They average a healthy 78+ inches of snow per year. The ski season is Banff is unusually long, typically running from November until May. Banff is a full service ski destination with equipment rentals, ski classes, comprehensive ski packages and deals, and it’s an exceptional location for kids to get introduced to the sport. For you skiers that are looking for more of a challenge, try the untouched powder of the backcountry of Banff National Park. If you’re looking to take a break from skiing, the area is great for ice skating on frozen lakes, cross-country skiing, snowmobile adventures, and more. Banff is a fun and exciting mountain community beyond the slopes and outdoor activity. They feature a vibrant art community, many local attractions, numerous dining options, boutique shopping, museums and other exhibits. To learn more about Banff and all its fun activities visit the city's website. When it comes to skiing locations with massive amounts of powder, few locations compare to the 50+ feet of annual snowfall offered by the mountains near Revelstoke. The runs here have huge vertical drops, in fact, Revelstoke is home to the longest vertical drop in North America, measuring over 5,600 feet. The skiable area covers over 3,100 acres and with only 59 runs, you’ll have a lot of freedom as you make your way down the mountains. 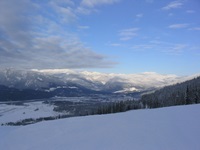 The major resort and home to most of the runs is the Revelstoke Mountain Resort. Only open since 2007, this resort is quickly becoming one of the best destinations for fans of big powder in North America. If you're new to skiing this may not be the best location for you to begin. Many of the runs are quite challenging and require a high skill level. The most experienced and daring skiers will love the helicopter drops onto mountain tops for the ultimate in untouched powder. The area has much to offer if you're looking for a break from blazing new trails. Whether you’re onsite at the resort or enjoying the community of Revelstoke, you’ll have access to dining, bars, shopping, music, museums and local parks. For more information on Revelstoke stop by their website and check it out. For our first pick in eastern Canada, Mont Tremblant in Quebec, takes top billing. This is one of the most busy and popular skiing destinations in all of Canada. The mountain itself reaches a height of over 2,800 feet with a vertical drop on its south side of 2,110 feet. This leaves an impressive 662 acres of skiable terrain. 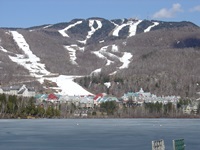 Most of the skiing is centered around the trails and runs of Mont Tremblant Ski Resort. In addition there are three different snowparks that have over 30 acres of different obstacles for fans of freestyle skiing and snowboarding. This is a great environment for skiers as well with over 160 inches of snow annually and over 1,000 snow machines constantly supplementing the regular snowfall. A great place for all different ages and skill levels, Mont Tremblant offers 21% of its trails for beginners, 32% for intermediate skiers and 47% for the advanced. Aside from the slopes the Mont Tremblant area is filled with fun activities that will appeal to almost anyone. A few activities include spa treatments, art exhibits, helicopter tours, fine dining and enjoying the stunning vistas that the Laurentians provide. For more information on the area visit the Mont Tremblant website. Just a short journey by train or car northeast from Quebec City you’ll find the skier's paradise of Charlevoix. 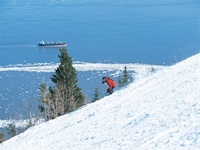 The main skiing destination in the area is Le Massif de Charlevoix. Reaching an altitude of 2,645 feet, it is the tallest point east of the Canadian Rockies. This high altitude also provides an excellent vertical drop of over 2,500 feet. They feature an abnormally high amount of snowfall with an average of 253 inches per year as well as 400 snow guns making snow on demand. Fifty-two different trails wind and run through this picturesque landscape and the total skiable area is over 400 acres. This is a great location for skiers of every skill level. Beginners will find equipment rentals, great instructors, and plenty of beginners hills to enjoy. As you go up in skill, the area will accommodate with runs that will challenge even the most seasoned skiers. The area has much more to offer than skiing, try sledding on groomed trails, snowshoeing through the majestic wilderness, going on a guided tour of local destinations and the list goes on. For more information please visit the local website to find out more.